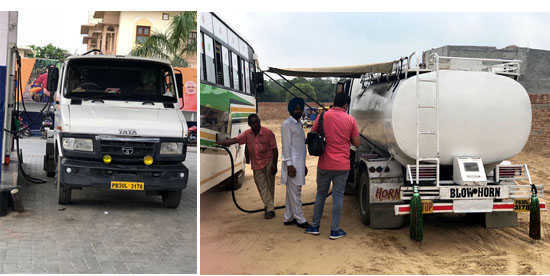 A team of government officials here on Thursday sealed a filling station owned by Shivraj Dhillon, father of SAD’s Gidderbaha constituency incharge Hardeep Singh Dimpy Dhillon, for allegedly filling tankers with fuel and supplying it in other towns. One FIR each was registered in Bathinda and Gidderbaha, while a fuel tanker was impounded in Bathinda. The filling station is located outside Dimpy’s residence. He and his father were present on the spot when a team led by officials of the Food and Civil Supplies Department, the Legal Metrology Department and the Indian Oil Corporation, sealed it in the presence of cops. The action was taken on the directions of Food and Civil Supplies Minister Bharat Bhushan Ashu, who had received reports that an IOC fuel station was supplying fuel in tankers to buses owned by New Deep Transport. The minister had sent Assistant Director, Food and Civil Supplies, Rakesh Singla to conduct a sting operation. Singla said he had received a complaint that the tankers were being loaded from Satpal and Brothers’ fuel station in Gidderbaha and further sent to filling stations in Bathinda. “On a tip-off, a team was stationed outside the filling station at Gidderbaha from 1 to 6 am. A tanker (PB 30 L 3178) of 4,000-litre capacity was filled. Another tanker (PB 30 N 7478) was also filled here,” said Singla. Diwan Chand Sharma, DFSC, Muktsar, said, “The proceedings in Gidderbaha and Bathinda were videographed.” In Gidderbaha, an FIR was registered against the fuel station owners under Section 7 of the Essential Commodities Act, Section 23 (A) of the Petroleum Act and Sections 285 and 336 of the IPC. Another case was registered in Bathinda.